Each year at the Outdoor Retailer show hundreds and hundreds of new products and designs are introduced by brands from all over the world. Of course many of these so-called “new” products or innovations are realistically “me-too” products. (me-too product: a brand introduces something new or different, soon after many other brands develop similar products). However, every year there is some real innovation and new or unique products are introduced. An every year some of the me-too products are really cool and push a concept forward in a show of one-upmanship. Now many of these products are still a year away from store shelves at the time of the OR Show, though some arrive early while others seem to take a bit longer. So as this years’ OR Show approaches I thought I’d recap some of the cool new things that I saw last year. If they’re not already available they’ll be soon and are worth a look next time you’re hanging out at your local gear shop. The focus of this rope design is safety and it takes the idea of a dual patterned rope to a whole new level. First, the Platinum has a permanent connection between the core and the sheath. This is done my weaving the sheath between the core yarns at fixed intervals along the length of the rope connecting the two. I’m interested to see how this will affect the failure mode of rope grabs which seem to pull the sheath off a rope in the 4-6kN range. Second, a unique tracer color and pattern is woven into the sheath that marks the centre and warns when the ends of the rope are approaching. Available in a fat 10.3mm and a more usable 9.8mm diameter it seems like Maxim is thinking mainly of the cragging scene. The Revo is the most radical departure from the norm in the design of a belay device I’ve seen in a long time. 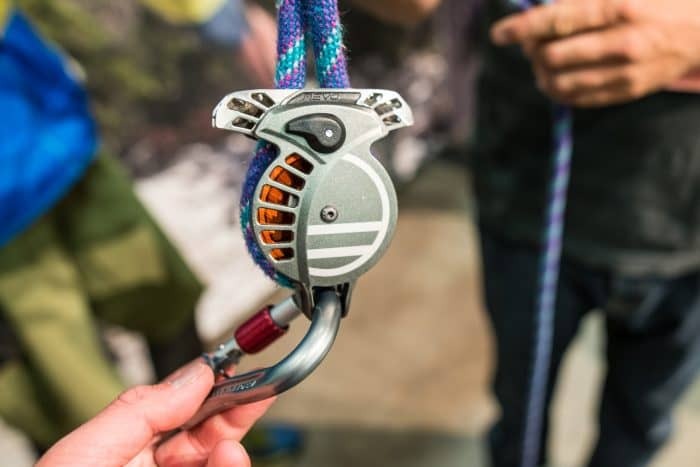 Dubbed as the “first Bi-Directional assisted locking belay device” it locks up thanks to an inertia-driven mechanism that engages a locking lug whenever the ‘wheel’ reaches a high enough speed. Basically if you pull the rope fast enough the thing locks up. Another really cool feature is that it cannot be loaded improperly, it works just as well from either end, and the carabiner won’t fit through unless the Revo is closed and loaded properly. It seems almost fool-proof! It isn’t without some potential detractions though I haven’t had the opportunity to test one out yet. First, it’s a bit heavy and bulky I doubt you’ll want to haul it up a multi-pith climb. Second, the device unlocks as soon as any rope is fed through, meaning that won’t be nearly as friendly as the Gri-gri for working a route. However, I can see them becoming really popular in climbing gyms. After writing this article I recieved a message from Wildcountry. It seems that while this product was at the 2016 show it won’t be available until the summer of 2018. 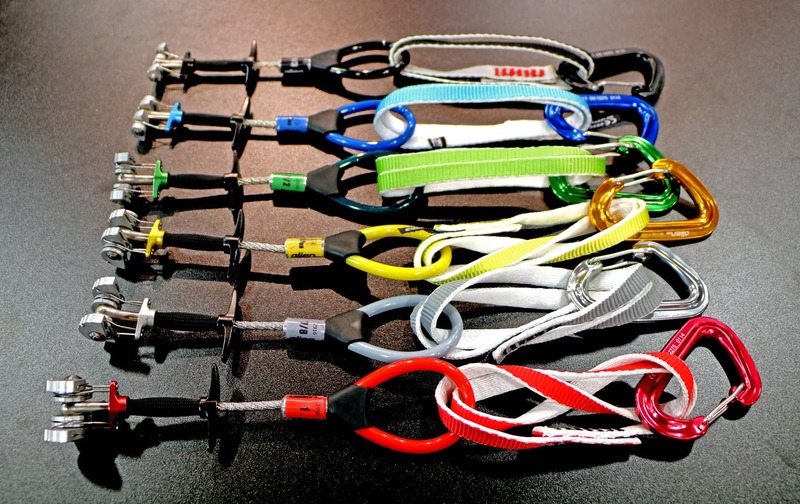 Edelrid’s Bulletproof carabiners attempt to minimize the wear-and-tear on ‘biners while keeping aluminum oxide from dirtying your hands and rope by adding a steel insert into the high-wear area of the ‘biner. Of course it’s not the lightest carabiner on the market given the steel insert but it will definitely be the longest lasting 55g carabiner by a long shot. In testing Edelrid found that the number of load cycles it took to destroy a normal aluminum ‘biner only put a slight polish on the steel insert! They come in both straight-gate and curved-gate versions, and of course as a quickdraw set. 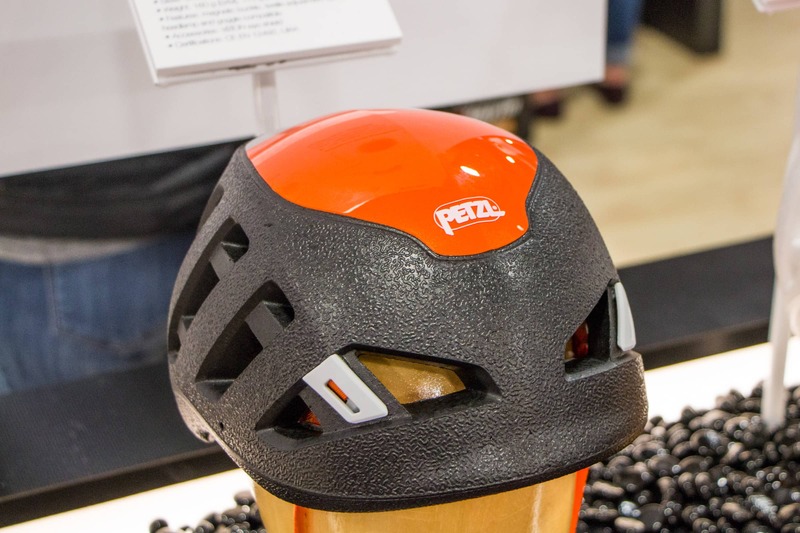 Petzl created the ultra-light helmet category with the introduction of the original Sirocco helmet and pioneered the use of EPP foam in climbing helmets. These matt orange foam helmets have a very unique and ugly look but have been hugely popular due to their durability and light weight. Now since the introduction of the Sirocco several other companies have come out with hybrid helmets that utilize a combination of EPP foam along the sides or back with a polycarbonate-polystyrene cap on top like the Mammut Wallrider. In response Petzl has upgraded the Sirocco to a hybrid design which has allowed the helmet to have a lower profile but maintain its dominance of the ultra-light helmet category. Along with the design upgrade is a color change, the helmet now comes in white-orange or black-orange and looks fantastic! Camp’s Dyon takes the proven Photon shape, refines it and adds a notchless nose. The design is unique in a wire-gate carabiner as the nose retains the narrow-profile of the Photon and the locking part is moved to the gate. The result is a light-weight snag-free ‘biner that will still fit everywhere a normal carabiner will! Camp calls this design the KeyWire, and the locking bit is called the SphereLock. The gate’s action is smooth and even, the opening is large and the slightly-curved spine a pleasure to hold. 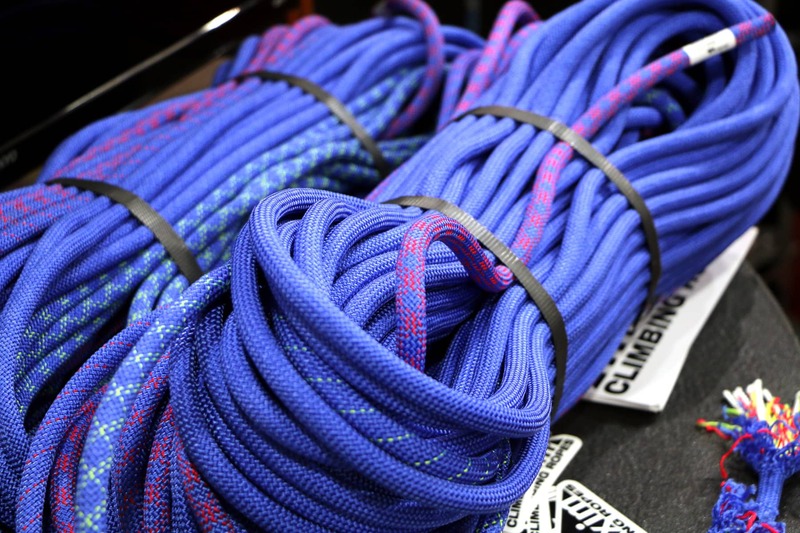 Weighing in at 33 grams it’s within a few grams of the lightest notchless carabiners available and comes in the usual assortment of colours for racking. 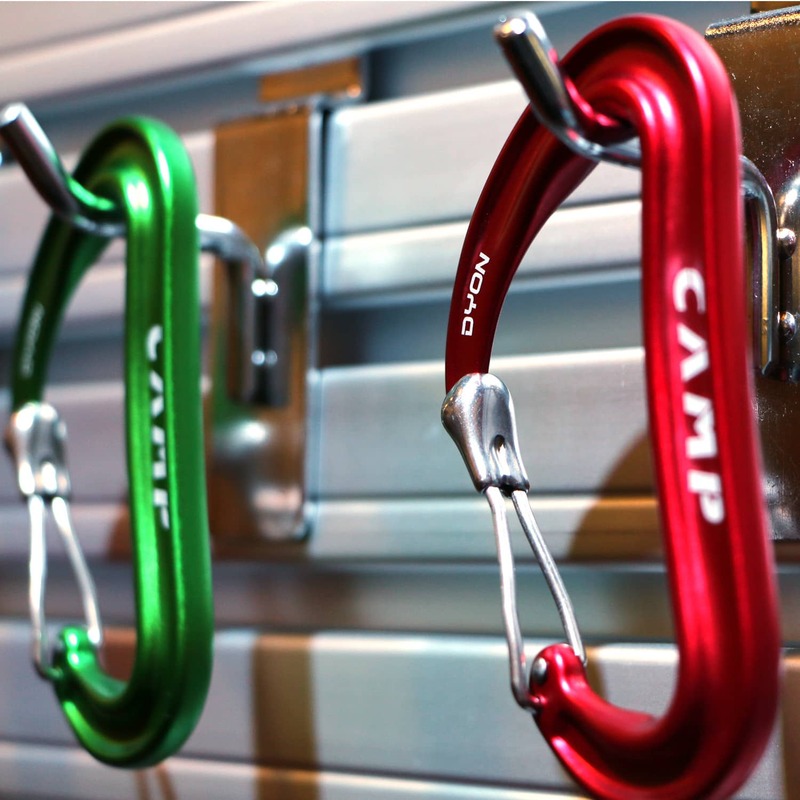 Camp has several quickdraws that utilize the Dyon carabiner as well. Since buying the patent for the iconic Alien cam, Fixe continued to manufacture the original but has also redesigned and modernized the Alien. This new Alien was dubbed the ‘Evolution’. Unfortunately, when they came to market there were a number of issues such as trigger wires fraying and breaking and the trigger sleeve failing. While these failures were not a safety concern (a failure meant the cam was hard to remove from a crack) they’ve been the source of a lot of warranty issues and climber frustration. In addressing these issues Fixe has redesigned a number of the features on the new Alien and released this upgraded model under a new name, the Revolution. These new Alien Revolution cams have gone to a solid trigger wire and replaced the plastic trigger & trigger bar with anodized aluminum. These changes seem to have addressed the issues and given this great cam a whole new look. I expect to have a full review out shortly. If you’re curious about the Evolution model check the full review. 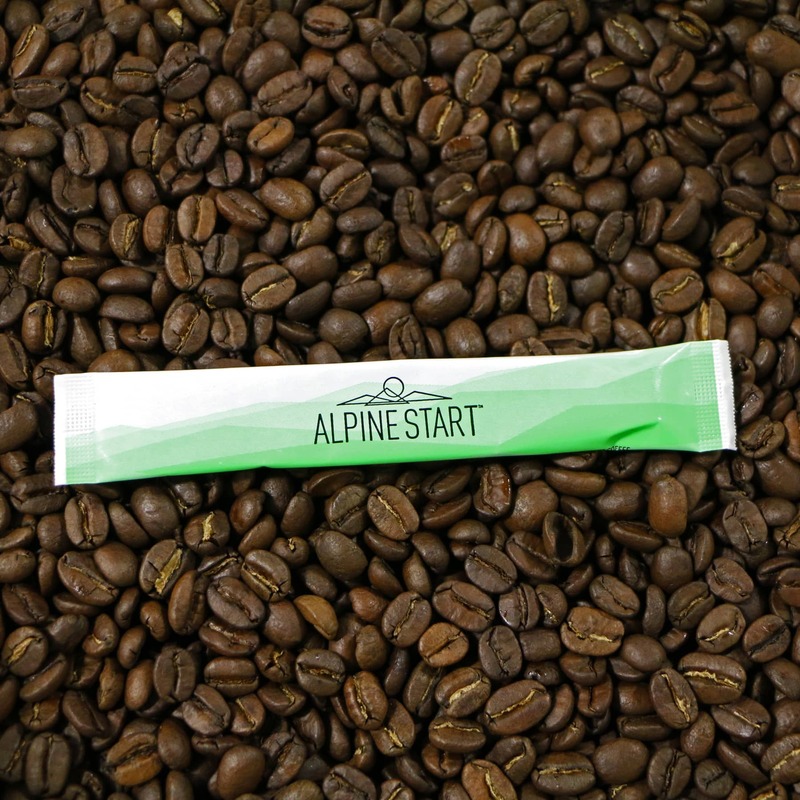 Move over Starbucks, there’s a new kid on the block when it comes to instant coffee: Alpine Start. Since the Starbucks Via came on the market it’s become a staple of fast-and-light adventures everywhere. The individual packets are small, light and quick to brew, the only downside was the bitter, burnt taste. The new Alpine Start instant coffee comes in similar small and light packages but with a vastly improved the taste. Basically, it tastes like a good cup of drip coffee! Like real coffee! For the full review click here. The GSI Outdoors Fairshare Mug has been a staple of back-country enthusiasts for over a decade. Basically a measuring cup with a screw on lid, it’s a favourite of alpinists, backpackers, climbers, skiers, etc. The reason: It works! That being said, the original FairShare wasn’t without its flaws. Basically the hard plastic handle makes it inefficient to pack and anything put into it cools quickly. So GSI Outdoors, inspired by the modifications so many people were doing with their creation, decided it was time to look at the mug again. 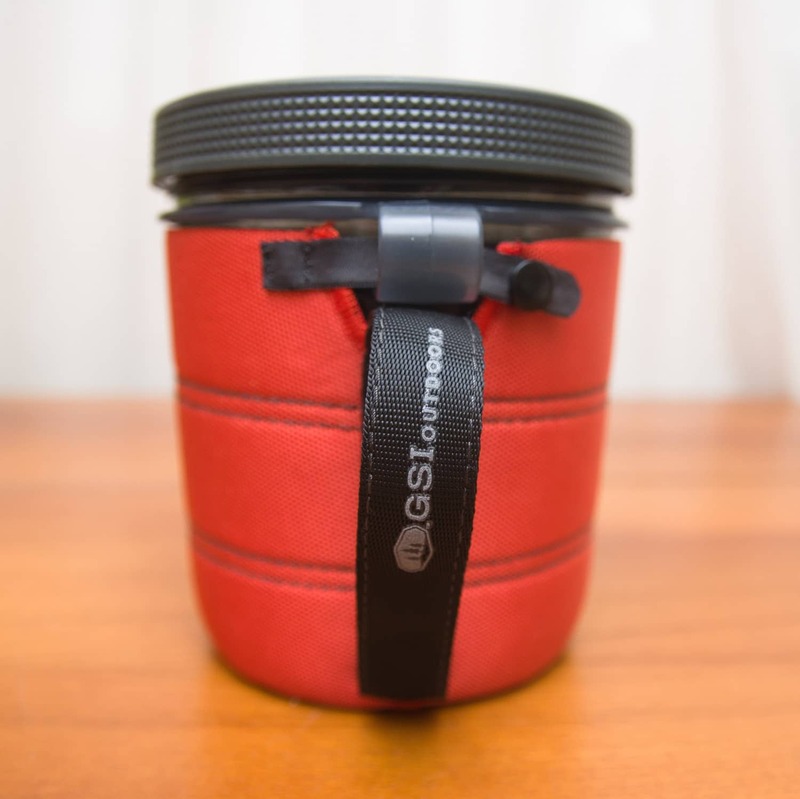 The result of this redesign is the new FairShare Mug II which sports a removable insulating sleeve to keep food warm and a soft handle (part of the insulating sleeve) to make packing easier. Some other changes were also made to the original design and are detailed in the full review. Overall GSI Outdoors made a fantastic backcountry camping tool made better! 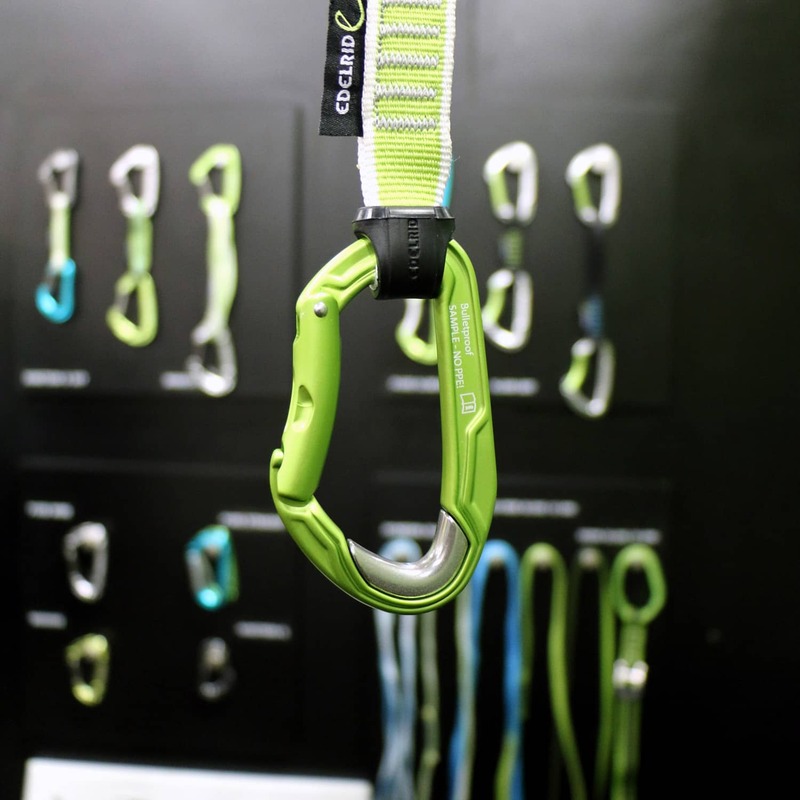 Petzl’s new GriGri+ is not a replacement for the GriGri2, but rather an addition to the lineup. 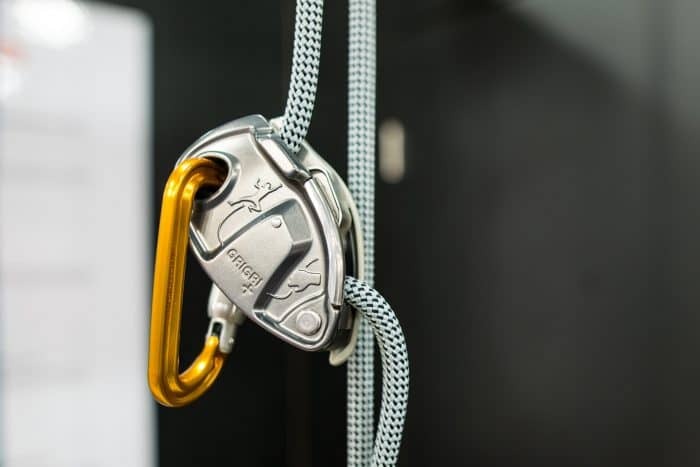 It has some new features (hence the ‘plus’ in the name) such as a steel wear plate along the top right lip, an anti-panic feature for lowering as well as two belay modes (top-rope & lead). In general it seems to work, feel and function much the same as the GriGri2, just with the aforementioned extra features. In playing with it a bit at the show I found the anti-panic device very subtle but without being able to lower someone it’s hard to get a good feel for it. The switch to alternate between ‘lead’ and ‘top-rope’ belay modes is found on the left side and is basically a spring tension adjustment. The idea is that a top-rope belayer wants the rope to grab more easily than a lead belayer where feeding slack is necessary. Not a device that you need to rush out and buy but likely the one you will want when it comes time to retire your old GriGri. While everybody else seems to be trying to make the lightest and smallest with everything DMM has bucked the trend. First with the new Dragons where they focused on safety over weight and now with their harness line-up where they’ve gone for simple, comfortable and functional. 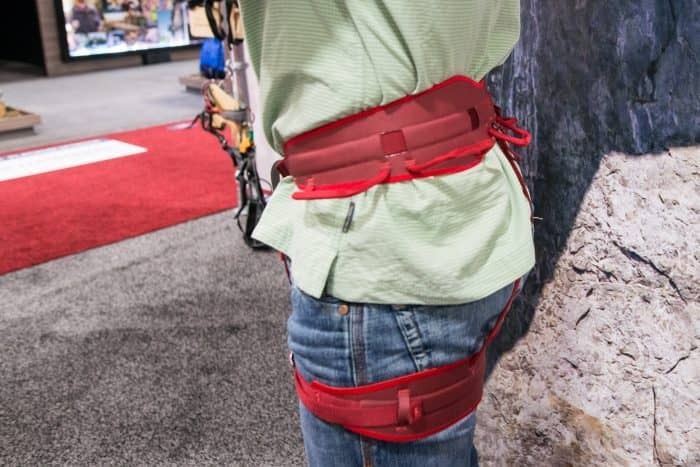 The DMM Eon (men’s adjustable legs), Creda (women’s adjustable legs), Asenna (men’s fixed legs) and Dala (women’s fixed legs) are not only very comfortable but are also the only harnesses out there with a ‘floating’ waistbelt. Basically, the ‘padded’ waistbelt is independent of the ‘load-bearing’ waistbelt, so you can center the harness over your hips, and ‘lock’ it in place by pulling it snug. The ‘padded’ waistbelt has 3D-bonded composite pads that are anatomically shaped for optimal weight distribution. The harnesses also have four ice-clipper slots (two on the side, two towards the back), the typical four gear loops, and a fifth central/haul loop. Weight is around 400 grams, depending on male/female and adjustable/fixed leg loops. But who cares when it’s this awesome?! Well that’s all the gear for now. Come September I’ll hope to put out an article new winter gear to watch for.